Digital multimeter is the the best electronic tool preferred by the professional technicians used for measuring lots of electrical parameters like voltage, current, capacitance,resistance, continuity and temperature. You can use it anywhere anytime because of its compact design and durability. 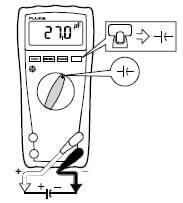 If you don’t know how to use multimeter then you are at right place, here we are going to explain you step by step how to use it for measurement of electrical parameters. Before using multimeter go through Digital multimeter working and working principle of digital multimeter for accurate results. 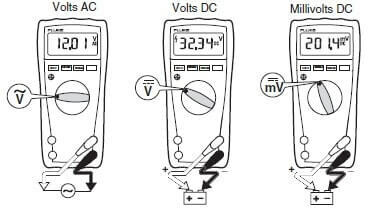 How to measure Ac & Dc voltages using a digital multimeter? 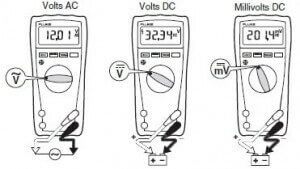 1 How to measure Ac & Dc voltages using a digital multimeter? 1.1 How to measure Resistance using a digital multimeter? 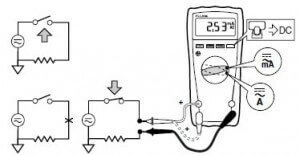 1.2 How to measure capacitance using a digital multimeter? 1.3 How to measure Ac & Dc current using a digital multimeter? 1.4 How to test continuity with a digital multimeter? 1.5 How to measure temperature using digital multimeter? As all we know, an Ac voltage is generally flow in our houses and has a frequency of 50Hz while Dc voltages flow in auto and household batteries and has a frequency of 0 Hz. Inside the COM jack insert the black lead. Inside the VΩ jack insert the Red lead. Turn the dial to voltage function either ac or dc. Connect the black probe to the negative end of the battery. Connect the Red probe to the positive end of the battery. Connect firstly the black lead to the circuit and after that the Red lead. Set AC or DC voltage as per your requirement. Press specific button gave on the multimeter to measure dc mill volts & ac mill volts. Note the measurement display on the LCD screen. When you have noted the readings, first remove the red lead from the circuit and then remove the black lead to avoid any electrical shock or damage to the device. How to measure Resistance using a digital multimeter? Resistance basically obstructs the path of flow of current. According to ohm’s law, resistance is inversely proportional to current indicates that the more resistance will results in lesser current flow through the circuit. 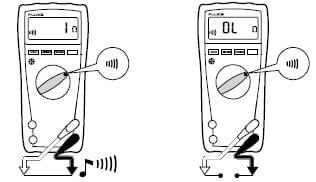 Turn the dial to Ω. Place the probes to the two end of the material. Set resistance value as per your requirement. 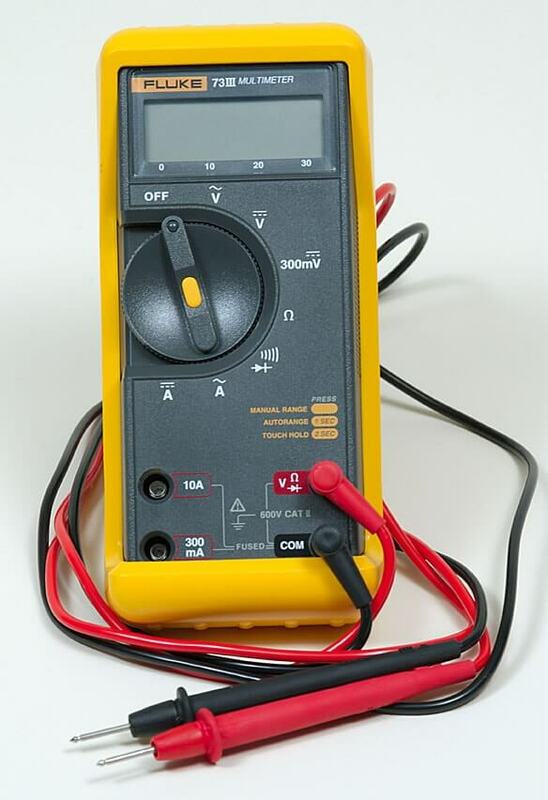 For measurement, the meter sends small current through the circuit. The resistance measured is the total resistance of all paths because the current flows through all possible paths between the probes. How to measure capacitance using a digital multimeter? As all we know, the capacitor is a passive device used to store electric charge and usually it blocks Dc and passes Ac through it. Turn the dial to capacitor function. Place the probes to the two end of the capacitor. Set capacitance value as per your requirement. 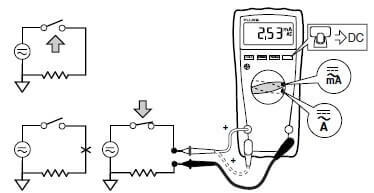 How to measure Ac & Dc current using a digital multimeter? Inside the mA jack insert the Red lead. Turn the dial to the current function. Set AC or DC current as per your requirement. Press specific button gave on the multimeter to measure dc mill ampere & ac mill ampere. Note the measurement display on the screen. When you have noted the readings, first remove the red lead from the circuit and then remove the black lead to avoid any electrical shock or damage to the device. Note: In some multimeters fourth jack is also available used for measuring high current above 10A. Procedure for that is also same as explain above, just you have to do little bit adjustments. How to test continuity with a digital multimeter? Continuity is the physical property which indicates the ability of the material to conduct current through it. We perform continuity test to verify and check the soldering points and to debug the circuit for broken lines etc. Turn the dial to the continuity function. Place the probes at the two ends of the material that you want to check the continuity. Now if you hear the beep sound then the circuit connected is a closed circuit i.e. it is a conductor otherwise it is an open circuit. How to measure temperature using digital multimeter? Some advance multimeters have in-built temperature measuring capability. 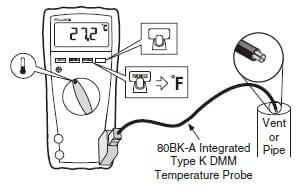 They measure temperature with the help of thermocouples connected. Inside the COM jack and VΩ jack insert 80BK-A integrated type K digital multimeter temperature probe. Turn the dial to Temperature function. Note the display reading on the LCD screen which shows the temperature of the Type K thermocouple. Press specific button of different colour depending on the multimeter for temperature measurement in Fahrenheit & Celsius. Hope you all like this article. For any suggestions please comment below.We always appreciate your suggestions.